The Brandon Mental Health Centre was established in 1891, and through time a number of very large buildings were added to the site, including the Valleyview Building, Pineridge Building, Nurses' Residence, Parkland Building, plus numerous ancillary buildings. 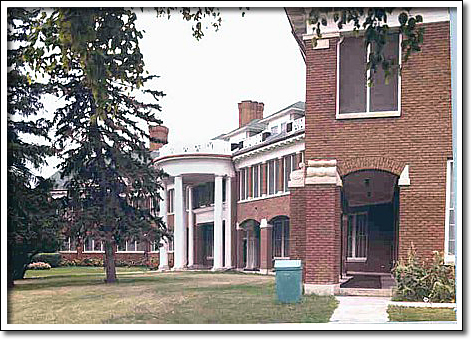 The Nurses' Residence at the Brandon Mental Health Centre was constructed in 1921–23 to the designs of architects Jordan and Over, important Winnipeg architects. Compared to the other buildings at the site, the Nurses' Residence marked a new way of thinking about mental health care, particularly regarding the main providers of the service, the nurses. While the other major buildings at the site are huge, grand and formal, the Nurses' Residence is informal and welcoming. Its angled entrance wings, balconies and delightful portico, and its carefully appointed interior, with decorative stonework, mosaic tiling, decorative plaster moldings, fine woodwork, and mural paintings combined to make the building an exceptional piece of design and a tonic for the hard-working residents. Due to the exceptional architectural qualities the building easily could be taken as a period resort hotel rather than a dormitory residence.